Home again. It always happens after being away for a couple of days; no matter how well I have eaten (or how badly), there is nothing like coming back home and having a hot bowl of porridge or soup. 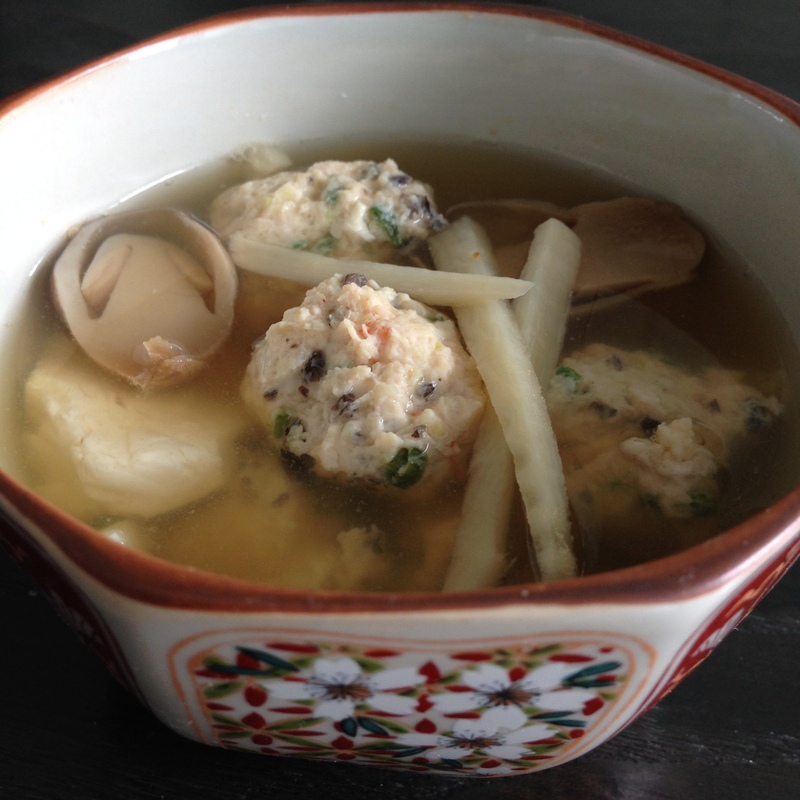 There is something terribly Chinese and comforting about hot soup. It has to be scaldingly hot before eating. I realised that kid #1 is terribly Chinese that way as he will want his soup heated up again just before eating. I suppose that nothing beats the comforting feel of the heat of the soup burning all the way down to the belly. The hilarious thing is that although I live in Singapore where temperatures hover daily above 30 deg C (80 deg F), most Singaporeans will never be completely satisfied with a cold meal or salad. Food has to be piping hot no matter how sweltering the temperatures are. Probably one of the most deprived experiences I ever had was travelling to Europe for a medical conference as a very young doctor. It was my first time travelling on my own and being rather impecunious (and stingy), I survived the first 4 – 5 days of the trip on baguettes and coffee. Entertainment was limited to walking along the beach in Nice, people watching and gnawing at cold bread. And there came a day I could not survive the diet anymore and found a small food court where amazingly, there was a Chinese food takeaway. It was a family-owned business and I discovered later that they came from Hong Kong. So dredging out my really bad French and almost non-existent Cantonese, I managed to chatter and gesture my way into a conversation about hot food. It didn’t need much explanation – immediately my server understood the primal need I had for a hot Chinese meal and he was kind enough not only to provide a piping hot meal but also to add a couple of extra side dishes for free (probably because by then I had a truly desperate Oliver Twist look). Anyway the origins of this meatball recipe is actually from dumplings. Back in my pre-low carb days, I would make fresh dumplings (水饺) for the kids (especially kid # 1, the dumpling addict). Now the filling of the dumpling has been refurbished to become meatballs, but for those of you out there who are less restricted in carb allowance, you can put this filling into pre-made wonton wrappers or dumpling skins. 1 knob of ginger about 2 cm long, peeled and cut into 2 large chunks. 2. 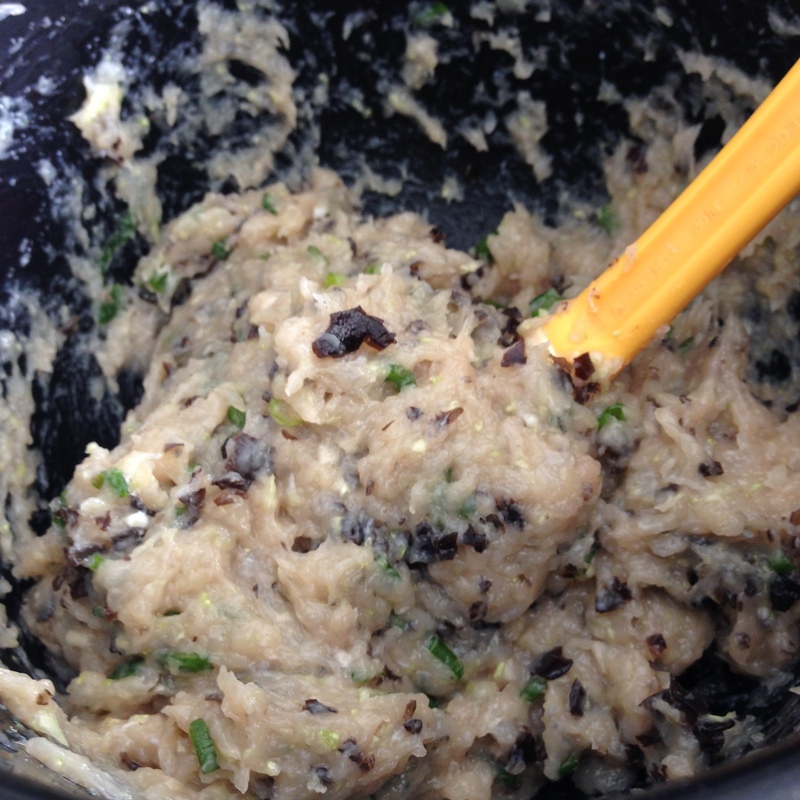 Place the garlic, black fungus and chopped napa cabbage into a food processor and pulse till finely chopped. Add in prawns and chop further. Mix the blended prawns and vegetables with the minced chicken and chopped chives. Add the soy sauce, fish sauce, chinese wine, sesame oil, pepper and arrowroot flour together. 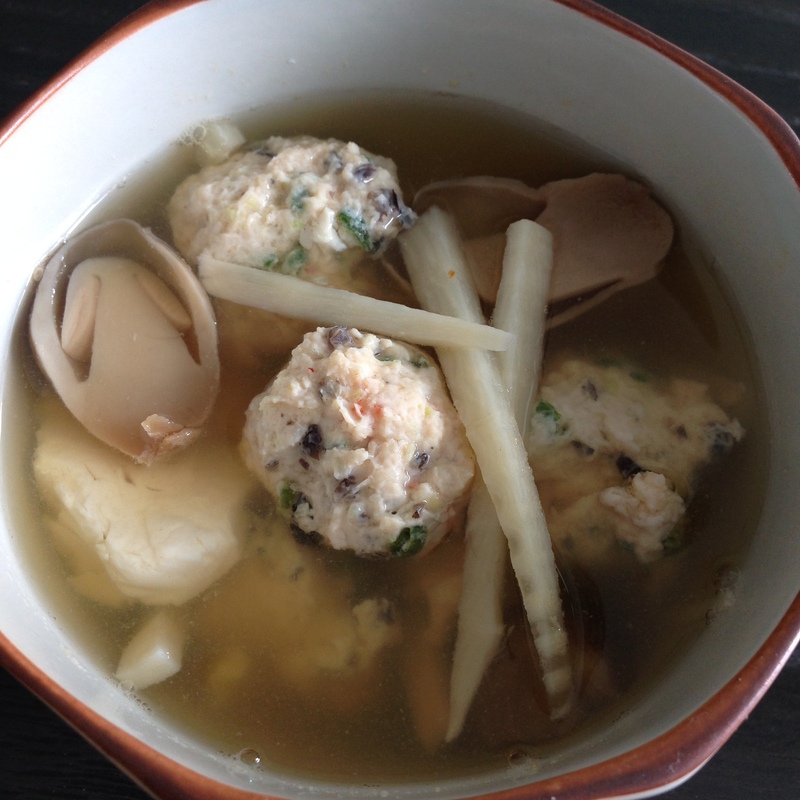 Seal the mixing bowl with wrap and place in the fridge while preparing the soup. To check on the flavours of the meat ball you can microwave 1/2 to 1 teaspoon of the mixture for about 10 – 15 seconds for a quick cook and taste test. 3. 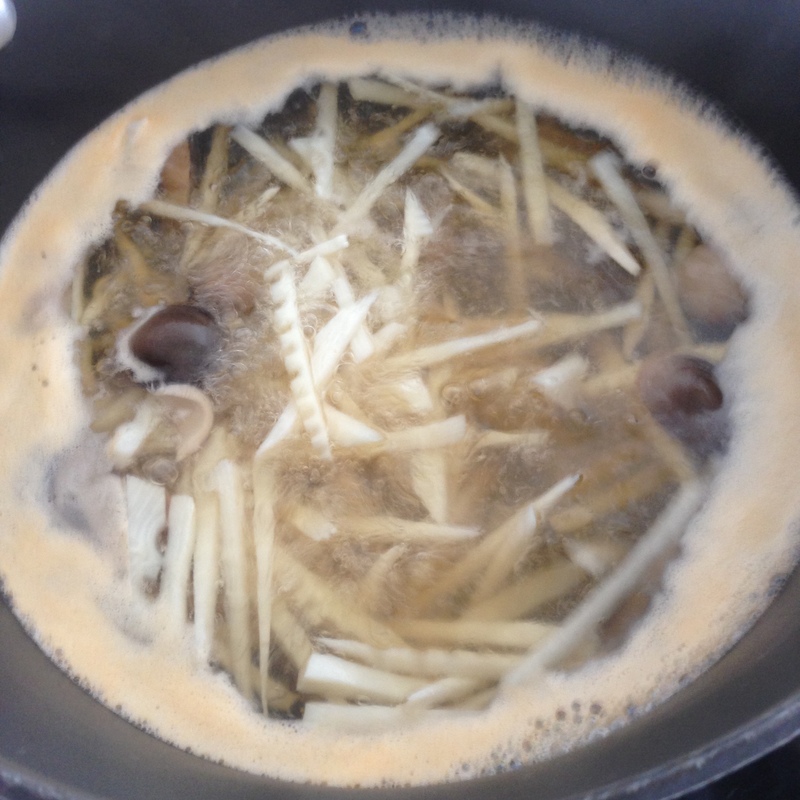 Prepare the bamboo shoots by soaking the strips of bamboo shoots in boiling hot water for about 3 minutes. Drain and set aside. This removes the slightly bitter taste of the shoots. 4. Dry fry the prawn heads and shell in a pot. When the heads have turned nicely pink and aromatic (about 3 – 4 minutes), add the stock and boil for about 15 – 20 minutes. Scoop off the scum over the top of the soup and drain the stock into another pot. 5. 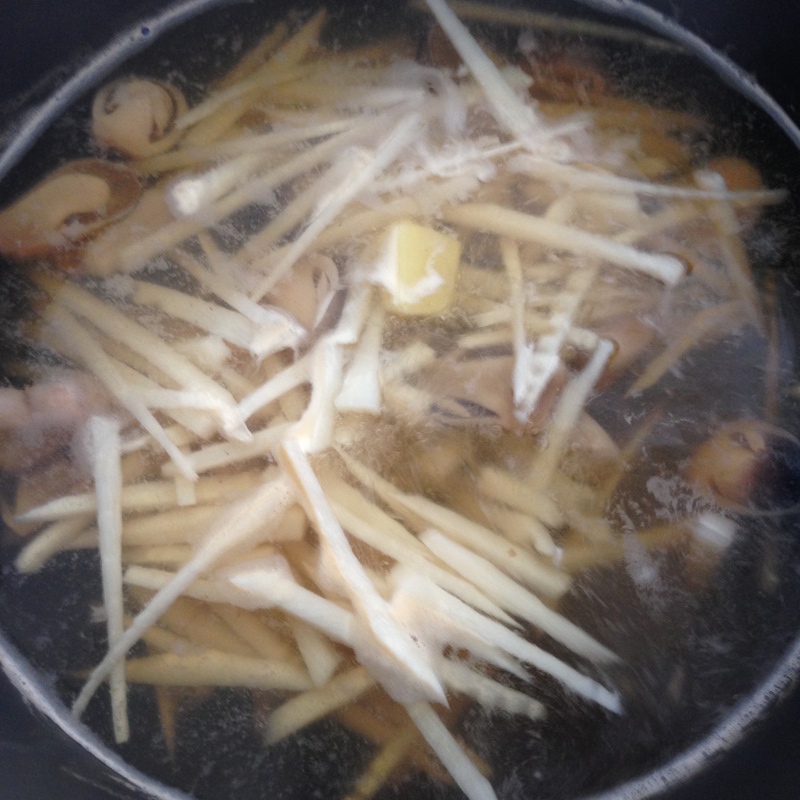 Add bamboo shoots, straw mushrooms and ginger into the prawn and chicken stock. Bring to a boil. You will (surprise!) see more scum rising to the surface and will have to scoop it out. Continue to simmer for about 15 – 20 minutes. Scum from the prawn stock. At this stage it is easy to use a spoon or ladle to skim off the scum. 6. With the soup boiling, use 2 teaspoons to shape little almost round balls of meat mixture and drop it directly into the soup. (You can also form these by hand. My 2 teaspoon technique just comes partly from my medical background where we do no-touch techniques for sterile procedures and the fact that I don’t really like to get my hands messy!) When cooked, the meatballs will rise to the surface. 7. Just before serving, drop in the tofu into the soup and boil a couple more minutes. Where do you buy fresh bamboo shoots? The ones I see in the Japanese section are imports from China and I try not to buy anything from there.